All good things must eventually come to an end, and StarTalk Live! Big Brains at BAM is no exception. This Sunday, we present our unprecedented Part 3 of our exploration of the inner workings of the human brain. As host Neil deGrasse Tyson says at the beginning of this episode, we’ve never done a 3-part show before, but we’ve also never had so much great material to work with. We’ve also never had this many people on stage before – 7 in all. In addition to Neil, our BAM show featured co-host Eugene Mirman, neuroscientists Mayim Bialik (of The Big Bang Theory) and Dr. Heather Berlin from Mt. Sinai Hospital, comedian Michael Ian Black, actor Paul Rudd, and surprise guest Bill Nye the Science Guy, who has guest hosted numerous StarTalk Live! performances on his own. Part 3 begins by looking at where neuroscience may be heading. First we explore concepts ripped from the pages of science fiction and comic books like telepathy, telekinesis and recording a person’s experiences and then re-living them vicariously through virtual reality. We also look at very real developments like hyperscanning, which can show what’s happening inside a brain during communication. Some of the questions from the audience were just as intriguing. One fan asked about savant syndrome, and whether we could we ever create a drug that would increase cognitive abilities in a similar fashion. Another asked about the use of psychotropic and hallucinogenic drugs like ketamine, ecstasy and LSD in treating brain disorders. And the questions just kept coming: Do other animals have consciousness? Is free will an illusion? What is really happening with Déjà vu? Is there any validity to the quantum theory of consciousness, and does consciousness have mass? One of the most interesting questions was about comedy, which led to a discussion about the complicated process and interactions involved in live comedy, as well as the neural basis for creativity and improvisation in comedy, jazz and freestyle rap. The last question of the evening, asked by a 9-year-old girl, was whether being born in space would affect brain development. Both Neil and “Uncle Bill” took turns answering that one, but it was Eugene’s comment that may have been one of the best lines of the night. 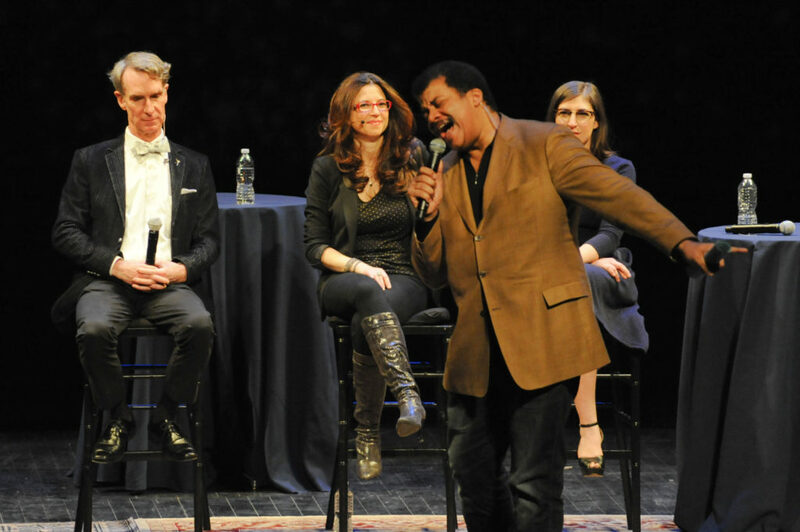 Please join us for the conclusion of StarTalk Live! Big Brains at BAM Sunday, August 3 at 7:00 PM ET on our website, iTunes, Stitcher, TuneIn and SoundCloud. And if you haven’t heard the previous parts of the show yet, you can listen to Part 1 here and Part 2 here.